North Sikkim Tour is the northern district of Sikkim. Mangan is the district headquarter of North Sikkim. At an altitude of 3950 ft the town is located at a distance of 65 km from Gangtok, the state capital. Tourists need special permits to visit North Sikkim beyond Mangan. North Sikkim can be visited only as part of an organized tour. Yumthang Valley - North Sikkim The road from Mangan goes straight to Chungthang, another major town of North Sikkim. At 5,600 ft. Chungthang is 95 km from Gangtok. From here the road bifurcates. The road to the left goes to Lachen and the road to the right reaches Lachung. 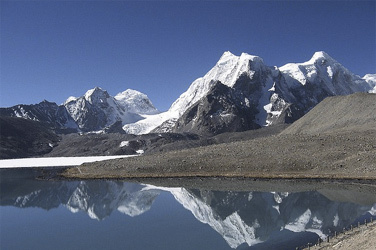 Lachen is the base from where tours to Gurudongmar Lake and Chopta valley is organized. Lachung on the other hand is the base for your tours to Yumthang valley. Note: Almost the entire zone of North Sikkim comes under the restricted territory, foreigner's visit beyond Thangu is prohibited. Tourism in the region is at a nascent stage and guests may not get the same level of service in north-sikkim as they would in other parts of the region. Day 01: Arrival - Gangtok: Pick up from Bhudrapur airport/Badogra. Meet the guide at the airport and drive to Gangtok. (126 km / 05 hrs.). Overnight hotel. Day 02: Gangtok: Early morning sightseeing of Rumtek Monastery-the principal seat of Karma pa out of Tibet and the largest one in Sikkim, and go to Kanchejunga View Point, Drul-Chorten , Sikkim Research Institute of Tibet logy, handicraft centers and check in hotel at Gangtok.. Evening Free to explore Gangtok. Day 03: Gangtok: easy excursion to Tsomgo Lake situated at the Indo-China border at an altitude of 12,400ft,Harbajan baba mandir,Nathula pass. (option to have an experience of Yak ride here). Enjoy the serene beauty of the lake and return back to Gangtok. Stay O/N. Day 04:Gangtok – Lachen: Departure from Gangtok in the morning for Lachen-North Sikkim. Lunch will be served on the way. Places of interest on the way are Tashi View Point, the historic Kabi Lungtsok, Phodong Monastery. Arrive Lachen. (Drive 123 kms/6 hrs). O/N at Lachen. Day 05:Lachen: Gurudongmar lake return back to lachen and lachung.Stay. Gurudogmar Lake is one of the highest lakes in the world, located at an altitude of 17,100 ft (5,210 m). It lies in the province of North Sikkimn, india, only some 5 kilometres (3.1 mi) south of Chinese borde. O/N lachung. Day 06: Lachung-Gangtok: After breakfast drive to Yumthang Valley –the valley of flowers (1200ft.) through yak-graded meadows, carpeted with Primulas, lined by Rhododendrons and waterfalls. Visit the Hot spring. Back to Lachung. After lunch visit Lachung monastery, cottage industry of walk to explore Lachung Village. After lunch drive to Gangtok. Arrive Gangtok. Check in hotel. Day 07:Gangtok – Depature : Early morning, drive to your destination either Bhudrapur Airport Bagdogra Airport/ NJP Station Trips ends!